As the youngest brother of PJ-AUTO Group family, PJ-AUTO Electronic Technology Limited comes into exsistance on Oct. 10th, 2009, with the mission to provide joy and safety to overseas automobile owners by bringing the excellent PJ-AUTO in-car entertainment & security products out of China to the global market. PJ-AUTO Group is one of the top leading companies in in-car electronics industry witin China, with 12 years R&D and marketing service in domestic after market and 5 years OEM experience to car manufacturers. In PJ-AUTO Group, there are three wholely-owned factories, two holding factories and one export company located in Shenzhen and Guangzhou. In our R&D department, we have over 30 elite engineers with an average of 8-year experience in in-car electronics who are concentrated on solutions & innovations all the time. Before 2005, PJ-AUTO Group’s focus was only on the domestic market, as PJ-AUTO people believed (and still believe now) that it would be day dream for a company to get sucessful in global market without being capable of serving its local market well. Between 2005 and 2008, PJ-AUTO group had been receiving repeated orders from other export companies, and thus PJ-AUTO products showed up in global market gradually. The customer feedback is good but far from excellent to PJ-AUTO group, because all the feedbacks are indirect, and PJ-AUTO’s engineers feel difficult to fully understand what our global buyers and users need. So we organized a special team to collect market information overseas since 2007, and PJ-AUTO engineers converts the information to products for our global buyers and users. 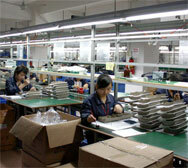 In 2009, PJ-AUTO Group decided to set up a special sales and service company for global market. The staff is carefully selected both in and out of PJ-AUTO group, whose value proposition is same as the PJ-AUTO Value. Providing joy and safety to automobile users. Providing joy and safety to customers and distributors in buying and selling our products.